Daimler Trucks (DTNA) recent Technician Skills Competition tested technicians’ ability to diagnose and repair the company’s Freightliner Cascadia, New Cascadia, Detroit Diesel heavy-duty engine, and DT 12 transmission. 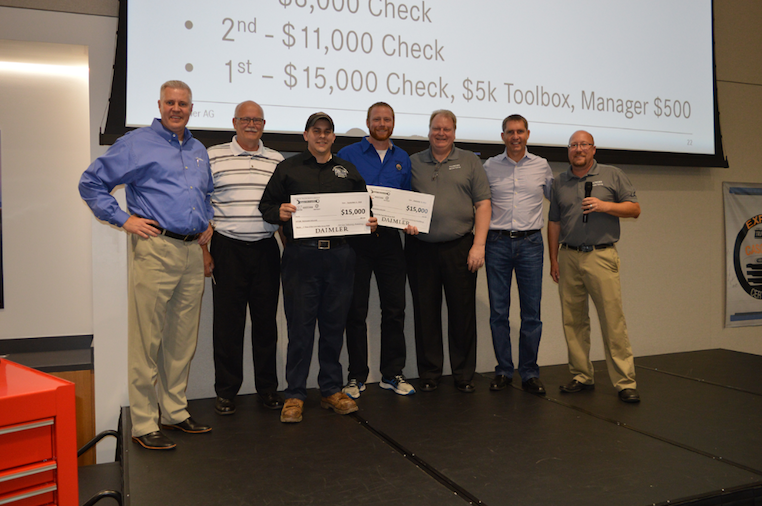 Travis Gannon of Lonestar Truck Group was the winner in the Vehicle Competition, and Terry Podralski of W.W. Williams Midwest came in first in the Engine Competition. “We’re proud of Travis and Terry and the level of expertise and commitment they demonstrate to ensuring our customers are back on the road as soon as possible. They’re great examples of the highly trained technicians we have throughout our network, who constantly strive to increase their skills and serve our customers,” said Stefan Kurschner, senior vice president DTNA Aftermarket. Get Ahead Program: Offers diesel schools access to web based training free of charge. Finish First: A 12 week hands-on training program where students earn certifications for Freightliner and Western Star trucks, and Detroit engines. Trucks for Training Program: Allows top ranking Get Ahead schools to purchase used Freightliner or Western trucks at a reduced price. Master Technician Recognition Program: Recognizes technicians that go above and beyond in providing customer experience.